Not long after we received our final letter from Leng Sopharath, a young Cambodian woman our family has been sponsoring for college over the past four years, the first royalty check from The Networked Nonprofit arrived! It was with sincere joy that I was able to donate the full amount of my share of the royalities to the Sharing Foundation in support of the educational programs. So, while I am delighted with the response to book , I’m even more pleased that the book is able to help young people in Cambodia. It’s made think about how far social fundraising has come in the last four years. 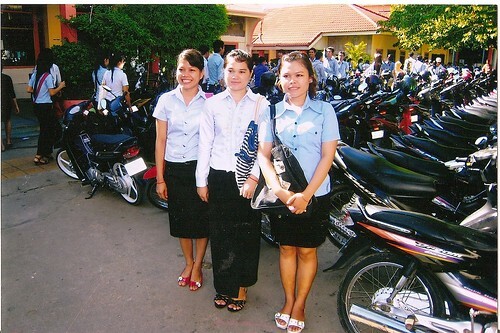 In December, 2006, I launched my first personal online fundraising campaign using my blog to raise money to cover college tuition costs for Leng Sopharath, an orphan from the same orphanage in Cambodia where my daughter spent the first 18 months of her life. I was able to raise $850 which helped cover the costs for her to participate in the Sharing Foundation’s college student sponsorship program and send her off to Noroton University with an accounting major in 2006. In 2006, the annual donation was a stretch for us … so we asked family, friends, and colleagues to donate to the Sharing Foundation in lieu of holiday or birthday gifts. Back then, I made these requests “offline,” but we had fallen short of our goal. At the same time, I heard about a new online donation tool called ChipIn and realized that fundraising badges like ChipIn gave me a tool to not only take my requests online, but also to seek out new donors who might support this worthwhile cause. It also gave me an opportunity to experiment with seeing how, if at all, social media tools might enhance an online personal fundraising campaign. That all seems like ancient history now but this started a journey of experimenting with personal fundraising campaigns using social media to raise money for kids in Cambodia and share lessons learned with other nonprofits. I felt lucky that I found a way to combine several areas that I am most passionate about! Sharing knowledge, social media, and supporting young people in Cambodia. I shared my lessons learned from my first campaign in 2006 in this case study, with best practices work today. For Leng Sopharath’s sophomore year, I used Twitter and with Chris Brogan’s help was able to quickly reach the goal and send two Cambodians to college through the Sharing Foundation’s program. For her junior year, I incorporated a fundraising experiment into my talk at Gnomedex and we were able to raise the money in less than 90 minutes and share some lessons learned. During her senior year, Leng Sopharath took ill – but the Sharing Foundation covered her medical expenses and I did a campaign experiment with Causes Birthday app and the following year as part of guest teaching in Jennifer Aaker’s Stanford Business School class. Like the morning event at the Guardian, the concepts of transparency and being more open resonated as did the “free agents.” The evening group included a number of folks who were responsible for social media and we had a productive conversation about social media and whether or not CEO’s or executive directors should have a presence. All in all, a fantastic time in London and special thanks again to my colleague and friend, Steve Bridger, for organizing these events. Meanwhile, thrilled to see that some new friends from Korea reading the book on their ipads. Reading this post is like traveling down memory lane. It is exciting that you gave the opportunity to help change lives in Cambodia to so many through your unique fundraising efforts. I am also excited to read about some of the results of those campaigns. 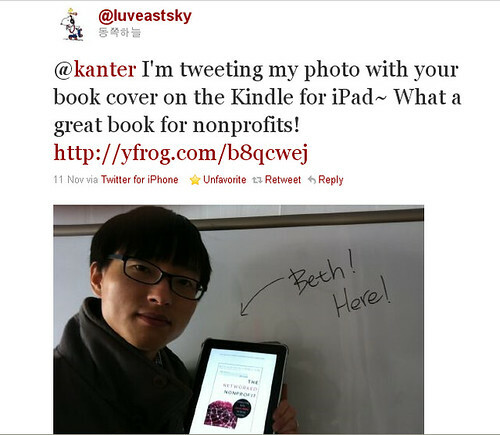 I continue to learn from you and your book (The Networked Nonprofit). Thanks!